This makes me wish I had a 300 gallon water tank on a trailer — or at least a few rain barrels. This isn’t terribly convenient, but if you are looking to reduce your household water consumption — maybe for a patio or balcony garden — this could certainly help. I would love to see this program expanded out to local neighborhoods so I could quickly swing by and fill up whenever I needed instead of having to do it on their schedule. LOS ANGELES—The Honorable Councilmember David Ryu of the 4th District, along with officials from the Los Angeles Department of Water and Power (LADWP), the Los Angeles Bureau of Sanitation (LA SAN), and the Los Angeles Zoo (LA Zoo) announced the opening of the City of Los Angeles’ Recycled Water Fill Station at the LA Zoo on Friday, June 17th, 2016. 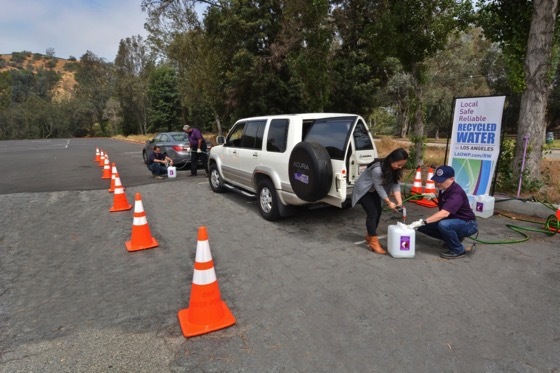 Every Tuesday beginning June 21st, the fill station will be open to all eligible Los Angeles residents and business owners who want to pick up free disinfected tertiary recycled water for approved, non-drinking uses like watering trees, shrubs and lawns. The City of Los Angeles’ Recycled Water Fill Station pilot program helps “Save the Drop” by offering recycled water to offset demand for drinking water as Los Angeles continues to weather through drought. The fill station is located on the northernmost side of the LA Zoo parking lot at 5333 Zoo Drive, Los Angeles, and will be open every Tuesday from 8:00 a.m. to 11:00 a.m. starting June 21. Qualifying customers can receive up to 300 gallons of disinfected tertiary recycled water for each day that the fill station is open. To avail of the recycled water, Angelenos must present their LADWP bill and undergo a training session to learn about the approved uses and proper handling of recycled water. Program participants must bring their own water-tight containers and sign a user agreement before filling up. Categorized under: Announcement, Events, In the neighborhood, Recycle.